When it comes to debates on the greatest football players of all time, the list is often only two names long: the Brazilian legend Pelé and the one they called the El Pibe de Oro, Diego Armando Maradona. When compared purely on their skills and accomplishments, choosing one of them becomes almost impossible. After all, that's why they both won the FIFA Player of the Century award. There is, of course, another Argentinian golden boy, Lionel Messi. A discussion about who could be considered the best are placed in the last part of this biography. Diego Maradona celebrating a goal for Boca Juniors. In Argentina, however, Maradona was always more than just a sports hero -- he was a divine figure. It was the Houston Chronicle that described Maradona perfectly: he was the combination of Michael Jordan's athleticism, Babe Ruth's power and Mike Tyson's human fallibility. In a country that survived many social frustrations and several military dictatorships, El Diego became a symbol of hope and an idol to millions. The nickname, "El Pibe de Oro", have some old Argentine tradition it it. Jonathan Wilson describes the pibe in the book Angels with Dirty Faces: "the urchin who will make his way trough life with a combination of charm and cunning" and as a football player the pibe remains "absolved of responsibility; encouraged almost, never to mature into adulthood". 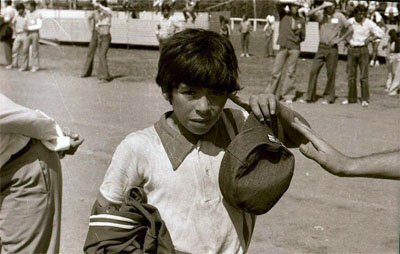 Diego Maradona was born 30 October, 1960 and grew up under poor conditions in Villa Fiorito near Buenos Aires as the fourth child of Tota and Chitori Maradona. Three years old, Diego recieved a ball as a birthday present from a cousin and it become a dear companion from the start. His exceptional talent was obvious from a very young age. When he was eight years old, he came to Argentinos Juniors for trials. When the coaches saw what he could do with the ball, they asked Maradona to give them his identification card; they simply couldn't believe that the boy was really that young (in reality, he was small for his age). Once it became clear that Maradona wasn't lying, the coaches decided to devote themselves to improving his skills. Even before he was ready to play matches for the senior team, the prodigy was in the spotlight: when Argeninos Juniors played, he would perform tricks with the ball at halftime. The reputation grow and he would be guesting a televison show doing tricks with both the ball and an orange. Diego as young football player. At 15 years old, Maradona made his official debut for Argentinos Juniors first team and became the youngest player ever in the Primera. A few months later, he made his debut in the Argentina national team, in a friendly against Hungary. This happened in early 1977, the year before Argentina would be hosting the World Cup. César Luis Menotti, the coach of the national team, finally decided to exclude the big talent from the World Cup squad – Diego was devastated. Maradona spent five years at the Argentinos Juniors, scoring 116 goals in 166 appearances (during this time, he met Claudia Villafañe who some years later would become his wife). When the time came to move on, he was able to choose between several well-paid offers. Although River Plate offered the most money, Maradona made his decision clear -- he wanted to play for Boca Juniors, the team he supported from his childhood. One of his dream would be fulfilled after Boca winning the league title that season. 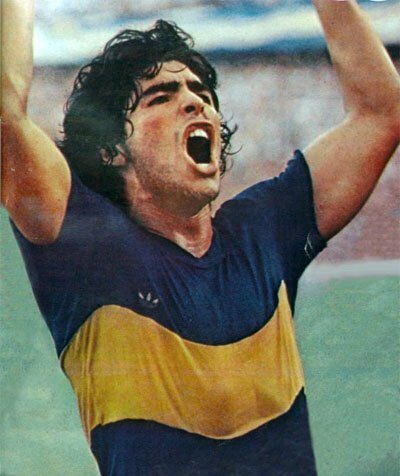 Despite the fact that he would only play a single season for Boca, Maradona made it a special one. With 28 goals in 40 appearances, he led the team to a Primera Division title. At the end of the season, he took part at his first World Cup. By all accounts, it was not a great tournament for El Diego. Due to internal tensions within the team and the opposing players fouling him at every opportunity, Maradona couldn't assert his dominance. After losing against Brazil (in a match that Maradona recieved a red card after kicking a Brazilian player in the midriff) and Italy, Argentina failed to qualify for the semi-finals. Still, this setback didn't stop Maradona from being transferred to FC Barcelona for a world record fee of $7.3 million. 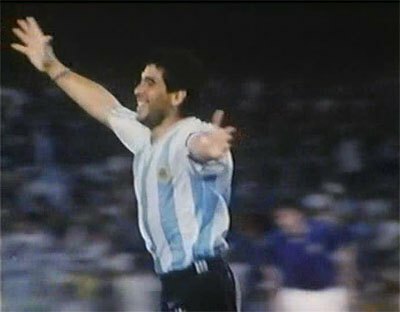 In the 26 June 1983 El Clasico, Maradona became the first Barcelona player to receive standing ovations from Real Madrid fans. Still, the Argentinian star didn't make the great impact in La Liga many had expected from him. The circumstances were not ideal. On the pitch Diego was constantly fouled (culminating in a broken leg after a horrific tackle by Goikoetxea. And outside the pitch the relations with the staff was sometimes bad (to change this to the better, Menotti was hired as a coach), and there were numerous parties -- Maradona made his first acquaintance with cocaine in his Barcelona days. Finally, a controversial field incident against Bilbao in front of King Juan Carlos and another 100,000 fans forced Barcelona executives to transfer Maradona out. What happened was one of the ugliest brawls on a pitch between two top football teams and with Maradona in the midpoint. In 1984, Maradona was transferred to Napoli for another world record fee of $13 million. Upon his arrival in Naples, a local newspaper noted that the city lacked schools, buses, houses, employment, and sanitation, but that none of that mattered as they had Maradona. Once he saw 75,000 Neapolitans at his presentation, Maradona decided that he would repay their love by giving it all on the pitch. The Argentinian surely made an impression in his first Seria A season (Napoli came third after Juventus and Roma), but much more was to come. In the meantime, the World Cup finals was to take place in Mexico. Maradona in the Napoli shirt. By the time the 1986 World Cup rolled around, there was no doubt about who the best football player in the world was. This time, there was no stopping him, with violent fouls or otherwise -- he was simply too fast and too powerful for everyone else, and the referees didn't allow the foul play that had been an effective method for the opponents four years ago. Thanks to his low center of gravity, ball control, dribbling skills, vision, passing, and reaction times, Maradona exerted his power against every player and every team he faced at the tournament. After eliminating old rivals Uruguay, Argentina was set to face England in the quarter-finals. This was the match where Maradona's legend was fully cemented. Just 4 minutes after sparking his team to a 1-0 lead by scoring with his hand -- an incident which he later called the "Hand of God" -- Maradona did something even more unthinkable. 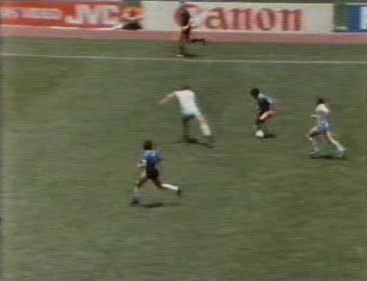 He received the ball in his team's half and then ran past five English players before slotting the ball past goalkeeper Shilton. Eleven touches, 60 meters. The goal of the century. On the way to finish off the most classic of all solo goals. Maradona followed this up by scoring a brace against Belgium in the semi-finals, setting up the final match against West Germany. 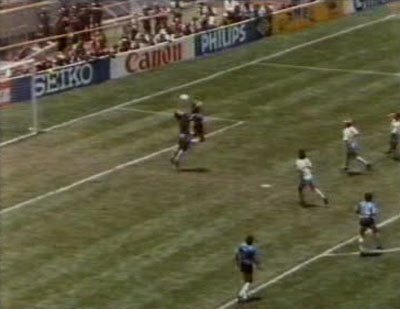 Though the Germans managed to contain him by double-marking, Maradona still decided the match by assisting Burruchaga for the winning goal. After leading his country to the first World Cup title in their history, Maradona was unanimously voted Player of the Tournament. Following the triumphant end to the World Cup, Maradona returned to club football. In his first season back, he led Napoli to a Serie A title. This was the first time that a team from the south of the country won a league title, and it happened at a time when North-South tensions were at a peak. After finishing the following two seasons as runners-up, Napoli won their second scudetto in 1990. Despite his success on the field, Maradona's personal life was getting worse and worse. He seemed to have vague connections with the Giuliano clan, a powerful part of the Camorra crime syndicate and was seen on a party arranged by the boss Carmine Giuliano. And unbeknownst to many, he was harboring a cocaine addiction since the mid-80's. Eventually, this impeded his ability to play football. Though that didn't stop from taking Argentina to another World Cup final in 1990, West Germany was too tough of an obstacle to overcome this time. The tournament was played in Italy, Maradona’s second home country at this time. When Argentina played against the home nation in Napoli, the Neapolitans was saluting their idol and many of them had a hard time to decide which team they favored. Maradona in the World Cup 1990 semi-final vs. Italy. But the life in Naples got to the worse. The press started to write about him and his mistress Cristiana Sinagra and their child that had been born in 1986 without public knowledge (a child that Diego would deny any connections to for a long time). Following a failed drug test for cocaine, Maradona finally left Napoli in 1991. He got a 15-month suspension during his drinking and cocaine abuse continued until he finally accepted a detox program and soon began to train again. After the suspension, he joined for Sevilla, coached by the former Argentine national coach Carlos Bilardo.Maradona would play only 26 matches in his new Spanish club and it was far from the success that had been in Napoli. After a debacle with the coach after being substitute in a game against Burgos in June 1993, Maradona had done his last match in Sevilla. He returned again to Argentina and joined Newell's Old Boys, but this part of his career would only involve seven games. 33-years old, he recorded his final two national team appearances at the 1994 World Cup, where an impressing comeback on the field was overshadowed by a positive drug test for ephedrine doping. He finished his national team career with 34 goals in 91 appearances. Maradona's last club would when be Boca Juniors (1995-1997) before calling it quits in 1997. Maradona's cocaine addiction went on until 2004; around the same time, he finally quit drinking and underwent a gastric bypass surgery. In 2008, he took over as the coach of the Argentinian national team. He kept that position until the 2010 World Cup, when he was sacked following a 4-0 defeat to Germany. Despite his controversial personal life, Maradona's impact on the game of football can't be denied. When asked about Maradona, Michel Platini said, "The things I could do with a football, he could do with an orange." Even beyond his incredible on-pitch talent, Maradona was known as someone who was never afraid to speak his mind on a range of issues on behalf of his teammates. Most of the time, that was enough. The best football player ever? Diego Armando Maradona is by many considered as the greatest football player of all time. The Argentinian “number ten” became its nations savior then helping his team to a World Cup triumph in 1986. It was the second victory in World Cup for Argentina and it would never had happened without Maradona. Maradona have become a living legend and the title as “the best player ever” was often split – depending on preferences – by him and Pelé. During the years several Argentininan players have been hailed as a “new Maradonas”, such as the Ariel Ortega and Aymar. Yet, not until a certain Lionel Messi arrived to planet of soccer, there have never been any on an equal level. The discussion about who the best player is have progressed along with Messi’s development as a player. The arguments that Maradona is the better of the both players can be made on such facts that he did both Argentina and Napoli to champions. Messi have not won the World Cup with his national team and FC Barcelona was already the domestic champions then he came to them. But the arguments could of course consider many more aspects, the football journalist Jonathan Wilson writes: "It wasn't just about his technical ability, about his gambetas, his free kicks, and his goals, but about him as an inspiration and an organizer. Of the other greats, perhaps only Cruyff -- although in a different way -- could match his on-field tactical brain".